I've noticed the chant more and more as the days have gone by. It's a chant usually preceded by the world "only;" as in "Even if the bomb had gone off it would have 'only' killed 290." "290" is by far the most magical number in the morass of magical thinking that's subsumed discussion of the "near disaster" of the Christmas attempt to give Northwest 253 a "premature landing". The number "290" is the number of passengers and crew on board the aircraft. "290" is a number we hear a lot in conjunction with discussion of this failed attempt at mass murder. A lot of people in the administration, the TSA, and those on the left attempting to excuse what happened would be happy if "290" stuck. If "290" can be made to stick then the disaster, tragic as it might have been, is merely a "pinprick" and can be, like so many other aspects of this monumental failure, lowballed. But "290" is, looked at from any reasonable point of view, at the bottom of the scale when it comes to discussing how many might have lost their lives. The ultimate outcome of NW253 being brought down could have been much worse and, like the attacks against the World Trade Center on 9/11, easily have risen into the thousands. When referring to "290" the Obama administration along with their media cohorts and apologists are assuming that the =/-400,000 pound Airbus 300 would have vaporized in thin air and, like some event in the Bermuda Triangle, the aircraft, passengers and crew would have simply gone to their reward in the middle of the sky with only a puff of pixie dust left behind. This is sweet nonsense since airliners, when bombed in mid-heaven, have a nasty habit of coming to earth. In flames and sometimes in pieces. 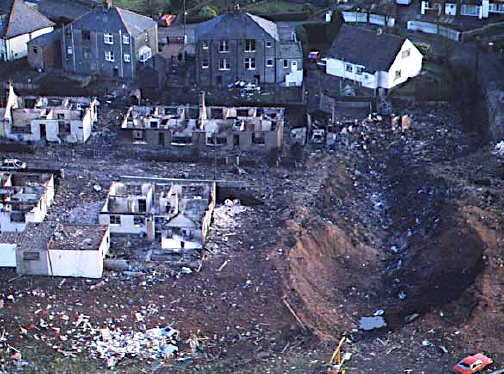 In flaming pieces is what happened to the closest parallel to NW253, the downing in Lockerbie, Scotland of PanAm 103. In that "incident" the parts of the aircraft fell onto a village of a few thousand people and killed 11 people on the ground as well as the 259 on the plane. At that point comparisons between PanAm 210 and NW253 diverge. Flight 210 was on climb out from London and, interestingly enough, on a course that would have taken it into Detroit. NW253 was on final approach to the same airport on a flight path that took it over the Detroit metropolitan area with a population of some 3,900,000. It is a much, much denser area; one that might be described as a "target rich environment" for a 400,000 pound flying bomb. This is one of those tidy graphics and blithe assertions that make one murmur, "Oh, isn't it pretty to think so." The flaw in the Star's speculation is to assume that the airframe of 253 would have suffered a catastrophic failure much like PanAm 210 over Lockerbie. Not so. The Lockerbie disaster was the result of about a pound of the plastic explosive Semtex going off in a forward baggage compartment with enough force to virtually sever the cockpit and forward part of the plane from the fuselage and wings which fell into the village. The explosive mixture in the underpants of the bomber on 253, while dangerous and potentially fatal, was of an order of magnitude less in terms of explosive power than a pound of Semtex then and now. As a result it is quite possible and even probable that the airframe of the Airbus 300 would have survived the explosion intact and given the crew a chance to try and take the plane into the Detroit airport. The Toronto Star acknowledges that the Detroit airport would have been the one that 253, with wheels down and already on approach, would have tried for. 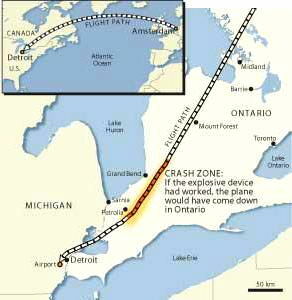 This means that at some point the injured airplane would have had to pass over sections of greater Detroit. This also means that, at any point, the plane's systems could have failed enough to have brought it down in a populated zone. Had that happened, the toll on the ground following the impact of an Airbus 300 would have been something greater than the 11 souls lost in the small village of Lockerbie. How much greater is unknowable since, through luck and passenger intervention, it did not happen. NW253 Flight Path. Suburban Density. It is a given that the captain and crew of NW253 would have employed heroic measures to keep the aircraft from crashing into a populated zone. The Google Earth flight path does show a number of options to keep the plane over a waterway and over reasonably unpopulated areas to the southwest of the airport. What is not a given is that the aircraft would have afforded them that level of control even if it had been flyable following an explosion of unknown force in seat 19 over the wing. It could well have been the case that following the explosion, even if the aircraft could be flown (as was the case when Aloha Flight 243 lost a large section of the fuselage in flight in 1988 but still managed to land) the question is how long the aircraft would have stayed in that state. Perhaps all the way to a safe landing or perhaps into the ground somewhere in Detroit. If that had happened the administration and the media and those who seek to minimize the near-catastrophe would be talking about a number bigger than 290. Much bigger. And much more devastating to the airlines, the Obama administration, and the nation. Along with the repetition of the "290" in the magical thinking that's going on about this incident is the repetition of the mantra, "This was a failed" terrorist attack. This is a lie. The only failure aboard NW253 was a "failure to detonate." In every other aspect, the attack was a great success for terror. The bomber got the explosive. The bomber concealed the explosive well enough to get it onto the airplane. The bomber ignited the explosive on the airplane while the airplane was in final approach and due to pass over the greater Detroit metropolitan area. The worst, however, did not happen. Other than that, put this one in the "Win but not with as high a score as we'd hoped" column for al-Queda. Calling the Christmas attack a "failure", as BHO's keystone cops administration and the chattering Left Wing Media are wont to do, carries the implication that it was somehow 'prevented'. That's why they keep it up. As with the rest of the morally adolescent effluent these people spew, it's straight up doublespeak. Recently there's been similar chatter on various comment threads and discussion boards regarding the statistically infinitesimal likelihood that any one American might experience death or injury at the hands of a terrorist. Therefore, in the mind of the moral adolescent, islamist terrorism isn't a priority - certainly nowhere near as important as "childhood obesity" for instance. The problem with all this magical thinking is that it's aimed at absolving the federal government of its Constitutional responsibility to keep American citizens safe from foreign attackers. As the world shrinks and the enemy chooses to ignore the rules of war, the notion of 'foreign' has become morally malleable, leaving the left an opening through which they can sidestep responsibility by minimizing the significance of the enemy and trivializing the casualties it manages to inflict. In my opinion is is not a win for Al-Queda, rather this makes them look stupid. It is in the interests of our dull government agencies to not let the enemy appear stupid, because then they could not explain away their failure to deal effectively with the problem. We are guarded from the stupid by the dull, who receive their orders from the twisted. "We are guarded from the stupid by the dull, who receive their orders from the twisted." I am not sure if you can call Detroit a populated area anymore. Yeah - remember how stupid we thought the WTC bombers were? They tried to get the deposit back on the rental truck used in the detonation. And there was speculation that the truck exploded early when the driver took a speed bump in the garage a little too fast? Ha ha! Those idiots. I don't buy it. They're not stupid. The knicker bomber and many others are willing to die for the cause. They're fanatical. They're testing new techniques. They're not stupid. Let's not misunderestimate them. Western Chauvinist is right: for all intents and purposes, these terrorists are not stupid. Their compatriots are intercepting video signals from drones in Afghanistan. We're the stupid ones for even failing to notice when these guys actually do stupid things.. Mohammed Atta and that clown Moussaui both left a trail of red-flag stupid acts that people in authority failed to act on. The same goes for the Knickerbomber. "Mohammed Atta and that clown Moussaui both left a trail of red-flag stupid acts that people in authority failed to act on. The same goes for the Knickerbomber." And the Fort Hood jihadist. Our enemies are not stupid; they are quite fanatical and very determined. However, saying all that is not to deny that they can also be naive and inept. Their naiveté lead the '93 WTC bombers to try to get the deposit back on their rented truck. Their ineptitude with their PETN bombs has been shown with the Shoe Bomber and the Crotch Bomber. I go so far as to believe that they should see the 9/11 attack as a failure: On the morning of 9/11/01, how many of us were envisioning 30k casualties? That it was an order of magnitude less was, IMO, due to two factors: 1) The planes hit early in the morning. Had they hit those buildings an hour or so later, many more people would have been inside. 2) The planes impacted the buildings too high. Had they hit the buildings in the 40's or 50's instead of the 70's or 80's, they'd have trapped far more people. A lower strike on the buildings may have lead to the WTC toppling like a domino rather than collapsing on itself. None-the-less Gerard, your point that those who believe that the terrorists haven't won something with NW253 is well placed. They won plenty here, and exposed a security hole that we have yet to close. That it is. But I tend to agree that the terrorists are not stupid, or even dumb, but are mostly untrained and amateurs. So when these attacks go off spectacularly well (from the bomber's point of view) one can usually find dumb luck involved. When they fail, mostly it's because the bomber is incompetent and screws it up. And most of them are incompetent. Has the hole in security been closed? I dunno. I avoid flying these days, as I tend not to be able to stomach the TSA precautions, which appear to me to be mostly window dressing. But at least they're trying something. I think my point here is that ultimately there is no permanent, fail-safe, unbreachable security protocol that can be put in place to prevent this. The best that can be done is to put on layers of protocol that will hopefully weed out most things. Somebody will always figure out an angle. We dealt with the same mind set in WW2 with the kamikazee. The only solution then, and the only one now, is to kill them before they kill you. I grew up in Dearborn. The flight path for Metro airport is right over Dearborn, and Dearborn is a fully developed, fully functioning city of 100,000. It isn't a ruin like Detroit. I have flown into Metro and looked out the window and said "There's City Hall, there's Fordson High School, there's Christ Episcopal Church, Dearborn High School - oh, look - there's my old house." Quite conceivably, and explosion in a jet liner could have landed on my parent's old house. I would liken the potential for massive disaster from 253 to the PSA Flight 182 that is billed as one of the deadliest crashes in our history. I watched in horror out my office window as this flight went down just on the other side of the canyon. A friend and co-worker was on the phone with her mother when the plane hit the ground on top of her mother's house. She heard the scream and then the line went dead as we all stood at the window not believing our own eyes. 178 crashed into a neighborhood of bungalow homes and the damage spread for blocks. Had 178 crashed just a couple miles further West toward the airport, thousands could have died, since that would have put it over downtown San Diego or perhaps the Home of the 7th Fleet. All 135 on board died, 7 people on the ground died, 9 others injured, 22 homes were destroyed and the first responders and some of the media covering the crash had to have hours and hours of therapy due to the gruesomeness of the scene. 253 blowing up over a populated area like Detroit could have caused catastrophic damage and thousands dead. We got lucky, the people on the plane got lucky, the people living near the airport got lucky. I, for one, am not comfortable relying on luck. Thank you for a perspective that I had not considered and have not seen discussed anywhere else. I had accepted that the plane would vaporize. We need the pain of individual stories to remember and stand up. I completely reject the premise, "But "290" is, looked at from any reasonable point of view, at the bottom of the scale when it comes to discussing how many might have lost their lives." I'm telling you, this 290 is a trial balloon. It is a foot in the door. And we've already said "reasonable." The leftists would love us to find this number acceptable. I reject this "only" x number of lives. In class today, one of my high school aged children was told by a teacher that it was only one plane so it wasn't anything like 9-11. The lefties have their talking points and they are busy talking them up. Kids who are in high school right now were in grades one through four when 9-11 happened. (Ages 6 thru 9) They do not have clear recollections of exactly what happened and how horrible it was. As yet, I have not seen the altitude at which 253 was flying when the ignition attempt was made. Given that final approach is usually declared at no more than 5,000 AGL (above ground level), and that Detroit isn't at an alpine elevation, a successful blast would likely not result in disintegration. Simply put, there would not have been sufficeint pressure differential between the cabin and external atmosphere to generate any sort of explosive decompression. Of course, should such a blast penetrate the fuel tanks beneath, that's another matter. Gerard, this of course, supports your contention that if a blast had rendered the plane incapable of flight, it would indeed have been a 400,000 lb. flying bomb, impacting mostly all of a piece. Final in a heavy is usually at something just over 250 kts true airspeed. 253 was about FOUR TIMES the mass of the PSA 178 that Sara described, which shattered a lovely section of my hometown. I've walked that impact zone a year after the crash, and was sick to despair even then at what I saw, and what could be imagined. Please, PLEASE get your pilot-friend-blogger (Flight Level ???) to provide commentary on the potential outcomes of 253 had the blast been successful. That would be an education. A frightening education. As is your review of Lockerbie. We can't let 'em shove these things down the memory hole. Not anymore. "But I tend to agree that the terrorists are not stupid, or even dumb, but are mostly untrained and amateurs." True. It's often the amateurs that, while generally ineffective, find the gaps in the system and are the hardest to guard against. What will be scary is when someone or someones eventually come onto the stage and amalgamate and coordinate it all into a jihadist version of the KGB. "What will be scary is when someone or someones eventually come onto the stage and amalgamate and coordinate it all into a jihadist version of the KGB." Pappy, Pappy ... he (and they) have already arrived. Unfortunately the US electorate mistook 'Him') for Jesus Christ II (and 'They' as his disciples) and voted Him in as POTUS. Already the damage he has done supersedes anything perpetrated by UBL, his baleful playmates and their suicidal deluded human weaponry. BHO will, if not stopped fortwith, eventually make UBL look like a minor irritant in geopolitics, as the US hegemony and western civilization gurgle down the vortex and the resultant chaos, in all probability, does-in our species. I sadly discern no residue of substantial support in the UK for the 'old' Uncle Sam. Once its firmest ally, after 12 years of concentrated socialism the UK is besotted with the hopey-changey Obamessiah; indeed the very 'opposition' party that should be on the brink of ousting our incumbent maggot ridden socialist administration has adopted he tactics and slogans of the Alinski schooled Obamites. Not, I fear, to reverse the Long March, but to receive the baton to continue it here, should they get elected. Conservatism here is dead, because what was worth conserving here is now either dead or moribund. We are now the puppets of Continental Europe who have never forgiven either your country or mine for having to defeat, or worse, rescue them. Anti-Israeli (predominately anti-Semitic) propaganda now abounds here. There is still time for you, but is there the will? Your decision in November 2008 was the final straw that dashed my last hope that, despite our dissolution under the neo-Marxist destruction of Britain's culture, predominant religion, sovereignty and social structure, America would resist the leftist-fascist cultural revolution that is in cahoots with fascist militant Islam and rescue Western civilisation from itself. Can't envisage that any more. Please prove me wrong, not for my sake, my term is mostly spent; but for the sake of of the progeny of both nations: nations whose evolutionary processes, inspirational inventiveness, energy and joint history deserved better than the events of the last decade - the Nihilist Noughties. I'm now infirm, tired and mostly spent; only my fingertips tapping out the last vestiges of resistance in my sentient cells can contribute. But surely there is enough collective latent vim and vigour still extant in both our nations to resist the usurpers and send them packing? This is one of the best forums in the Ether. Long may Gerard's clarion calls rouse the sleeping soul of the US of A and continue to entertain and inform us with his prose and pictures for the sad duration (or throughout the imminent renaissance), whichever. Only you people can choose. And Dearborn is also a mostly Muslim city, which fits with Al Qaeda's pattern across the world of killing Muslims. And Dearborn is my hometown. And I do not live there because my job is in Lansing. And I moved because I got the job in Lansing. And Al Qaeda does not care who it kills, so long as all bow to it.